Just another Tuesday morning. After we all got to stay home together for MLK Day on Monday, it's back to the routine, back to the grindstone. That is - until the blinds were opened to reveal a beautiful winter wonderland! There is nothing better than that first glance at your snow covered neighborhood, especially when it is a great surprise; then it's all eyes on the t.v. to see the beloved words SCHOOL CLOSED! So instead of commutes, ABCs, packing lunches, and "Hurry up - we're late! ", we had snow angels, cross-country skiing (you know Allan and his sick need to exercise), hot chili, and another good family day. We already know that school is closed tomorrow because of expected ice. Another good day in the forecast. This is so funny... I remember when things were closed because of an inch or two of snow when we lived in PDX. Here in Wenatchee... No such luck. SNOW PLOWS. They mess everything up. Snow is such fun, especially when you can get back into a warm house and have a mug of hot chocolate! 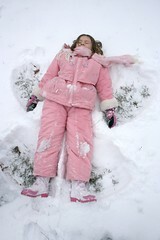 Glenn and I didn't make snow angels, but we did hike down the hill to get the paper. It was breath-taking in more than the obvious way--just beautiful! We enjoyed watching a little bird hop through the little mounds of snow on our deck railing as if it were doing moguls--just for the fun of it! Those were our favorite days in Virginia! We had a blast too. With big brother in school Caleb and Hunter enjoyed having the yard to themselves. They built a snowman. Then Nathan and his friends built a snow fort after school. 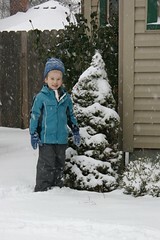 This was followed by the neighborhood kids having a snowball war.